Cost, approx: XS 900 Euro. 1299 Euro including stands and spikes. Xsub 990 Euro (+100 Euro for stainless steel spikes). SPECIAL introductory price: 1999 Euro for full package of XS + Stands + Xsub + Spikes (saving of 400 Euro). Well I can save a lot of typing by sending you directly to the Pure S review as the XS use a near identical box, if one much smaller. Apart from the size the only fundamental difference is that the XS is a single driver speaker using a small (approx 4") driver sporting a whizzer cone in place of a tweeter. As with its larger brother the build quality is as good as the price would lead you to expect, ditto the matching stands - again simply scaled down versions of those supplied with the Pure S.
They are very small, only the recently reviewed 'JohnBlue JB3's being smaller (see more later) at just 15 x 24.5 x 24.5 cms and pretty light at 2 kgs. Once again the driver is paper coned and in-house as are the binding posts. 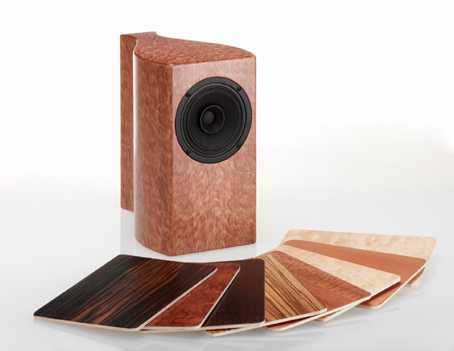 The review pair were supplied in a rather unassuming (read 'boring') brown-stained veneer, but some really beautiful finishes are available - see pics. 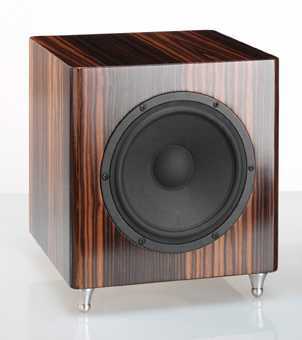 The sub is similarly small, being just over a 30 cm cube with the typical Trivox turned, stainless-steel feet. Again the brown veneer was supplied, but it'd look good in the other finishes. It's a fairly conventional looking design, 130 watt rms amp, volume and crossover frequency adjustment, and connections come from the amp, and out to what now become the satellites. As the sub has an active crossover built in, this means that depending on setting the amount of bass shared between the satellite and sub can be adjusted. Which bring me to the thorny question of Sub/Sat systems. Sub/Sat Systems. There are two ways of running a proper active subwoofer. The first is what I would call a 'true subwoofer'. In this case the main speakers operate as usual, i.e. the signal goes direct from the amp and the speakers output is unchanged whether the sub is on or off. Then the Sub is set to roll in just at the point where the main speakers roll off. So for example, in my own system I use wardrobe-sized Loth-x Polaris Horns which roll off steeply below 50 Hz. Below this I run a REL Stadium subwoofer which boosts frequencies from 16 - 50 Hz. When switching off the subwoofer the sound changes very little overall, but there is a reduction in ambience and a slight lightening of very low notes. It's subtle, but very, very worthwhile. With a Sub/Sat system the normal scheme is to run an active crossover in the Sub, this cuts the bass signal to the 'Satellites' with all the lower bass being handled by the sub. The advantage of this is that it takes the task of producing bass away from the main amplifier, and the usually small satellites don't have to handle low bass, both improve power handling and dynamics. My problem with such systems is that I've yet to hear one that works. Even with seriously hi-end installations (10,000 Euro) I can just tell it's a sub/sat. The minute the sub is asked to go beyond 120 Hz or so you can 'see' where it is. Even with systems using two subs the ear is drawn to them every-so-often. The other problem is integration. You have the sub part powered by one amp with certain characteristics, and the satellites powered by the main amp which is unlikely to be identical. Even if the sound is perfectly integrated at one volume, a change in sound pressure has you out of your listening position to fiddle with the crossover (assuming it's adjustable). My decision to give the XS a review of it's own was made within 30 seconds of plugging them in to check they worked on the day they arrived. These are truly tiny speakers, but the dynamics that came out of them was beyond anything I expected. In some respects they were even more impressive in this respect than the Pure S as it was so unexpected. Obviously their bigger bother was 'bigger' and more dynamic but to hear real power and energy from such tiny boxes convinced me that here were sub-miniatures that had to be taken seriously. Of course this brings them right up to compete with the JB3's that impressed me a few months ago. But in fact, although they seem very similar - tiny, full-range speakers - they are completely different. Remember the JB3 is designed specifically to work on a bookshelf, or next to a computer with their rubber buttons underneath and front firing port. In both these situations the XS is a non starter - it has a large rear firing port and really needs to be in free space, and best of all on its own stand to sing. Yes you can run it on a mixing desk or by a computer if there is space behind, but my workstation is hard against a wall. Given free space and decent stands the JB3 runs out of steam earlier than the XS, and unless used at very moderate levels will get lost in any reasonably sized room, the XS makes a altogether bigger sound. Having dispensed with that, we are left to review the XS in isolation, and given sympathetic ancillaries (the supplied Lehmann amps were perfect) the XS proceeded to show a strong family resemblance to the Pure S. For a small speaker the 92 dbl efficiency figure is pretty good even given the 4 ohm load, and the Lehmann's 20 watts were capable of producing pretty loud levels in my 7 x 5 m listening room. Turning the wick up inevitably exposed the midrange somewhat with the bass dropping back in comparison, but this kind of compression is inevitable with such a tiny driver even if the XS only showed this at near party levels. At more reasonable levels, serious listening rather than background music, the presentation could kid you that much bigger speakers were performing. As already mentioned the biggest surprise being dynamics that would shame speakers 4 or 5 times their size - the crack of rim-shots, the thwack of a bass string, hit of the hammer on a piano string etc were all handled with considerable aplomb. Yes bass obviously rolls off pretty steeply below the stated 75 Hz, but the result was always musical and engaging. As with the Pure S, that immensely rigid cabinet with few standing waves gave an extremely detailed picture of what was recorded, the imaging similarly precise, even if it was more of the pinpoint variety rather than the big bold images of a larger speaker. In some ways you are reminded of headphones, such is the lack of colouration. But... 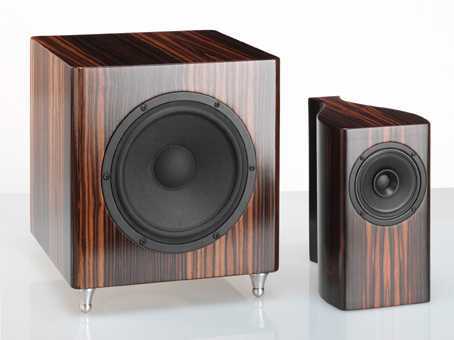 The XS are designed to run full-range and the claimed +/- 3dbl is from 75 - 18,000 Hz. Usually satellite systems use small speakers which abandon all hope below 150 Hz - in this case by playing with the crossover the Sub/Sat system actually becomes a true main speaker + subwoofer. The XS are not effected by the crossover, they run full-range regardless of the sub-crossover setting. So the secret is to get the sub crossover set so that it simply fills in below the point where the XS begins to roll off. Setting the crossover (by ear) to be around the natural roll-off of the XS (probably 75 Hz) the result was very different. I did this by playing a bass heavy disk (with the sub volume high) and lowered the crossover point until the bass coming from the Xsub became separated from that from the XS alone. Once this point was found I then dropped the volume of the sub until switching it on and off didn't make a difference to the bass level, and then turned it up a fraction, You are trying to get the point at which there is a tiny audible difference but no more. This gives a very rough approximation and gradually increasing the crossover frequency from this coarse point may fill any apparent hole, but at no time should the Xsub be obvious in its operation. Straight away the classic advantages of a sub became obvious. Switching out the sub collapsed the soundstage onto itself - back on and the whole thing opened up. Yes low bass was also lifted, but you'd be surprised how little bass there is in most recordings below 75 Hz. Although the effect isn't in-you-face, once you've heard it it's difficult to live without. The Sub, being small, doesn't reach down to the infrasonic like the big REL, but nevertheless at 35 Hz you will be getting the fundamentals of all instruments this side of a 32' organ pipe. As a bonus the rather incisive imaging, being replaced by the bolder variety mentioned earlier, with greater depth, and volume limitations being reduced. As a combination the XS and Xsub work together pretty seamlessly and in some respects even embarrass the Pure S. The Xsub would of course pair up with the Pure S, but as the former reaches down well below the XS I think Trivox could usefully create a larger sub to match. 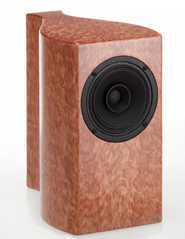 The real competition for the pair is of course similarly priced, but much larger floorstanding speakers. This is a big, and now very competitive arena and for a given budget the floorstanders would make a strong case for themselves (good ones of course!). However the XS is a niche product that allows the hi-fi to be discrete rather than dominating a room, this illusion of sound from no-where should not be underrated, quite apart from aesthetic considerations... On a purely musical level it also makes a strong case for itself - the biggest single advantage over floorstanders being the very low colouration levels of that tiny, rigid box. In a small room the XS will be hard to beat, and the sub can always be added afterwards.